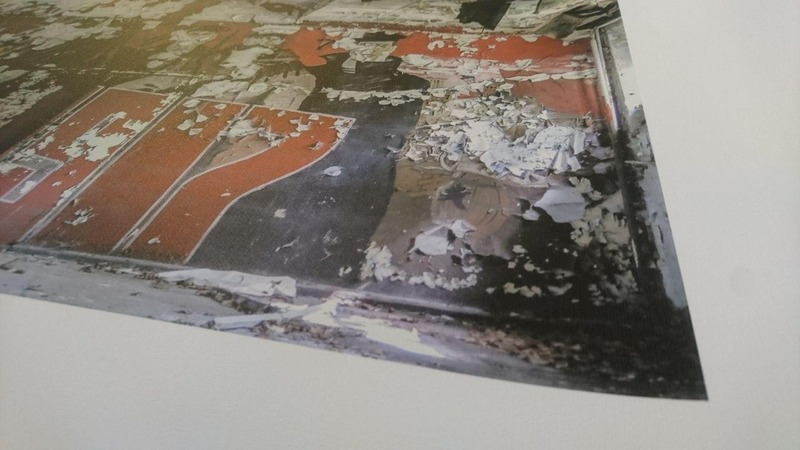 Lost Places Poster from abandoned Soviet Barracks :: worldwide shipping! All motives from abandoned Soviet barracks in Brandenburg. More information about the motives at the bottom of this page! When ordering, an additional info sheet with more interesting background information is added to the box. The prints can be hung directly on the wall as posters or individually framed. Shipping in a special, trapezoidal corrugated cardboard shipping box. What is the background of the motives? 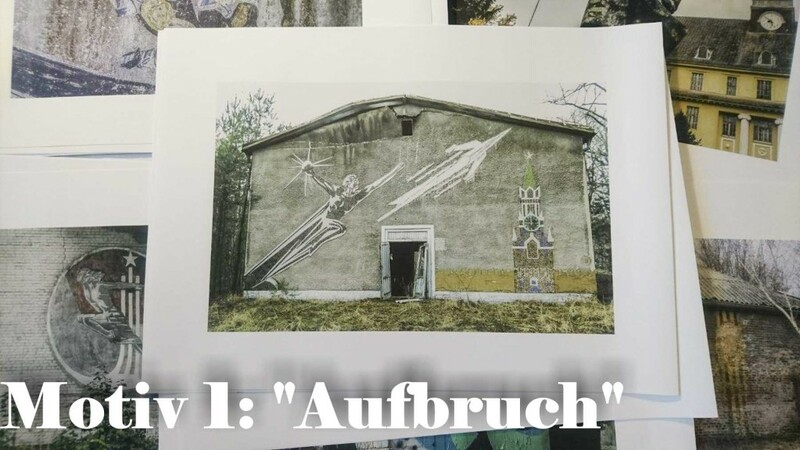 A particularly atmospheric motive is the print "AUFBRUCH" (waying/awakening). On the façade of a Soviet barracks in the Brandenburg hinterlands, there are mosaics that tell of the splendor of their homeland and proclaim a promising future. On the right side of the picture is the Spasskaya Tower (Savior tower) of the Moscow Kremlin with the Kremlin wall. This motive can be interpreted as a reference to the history and tradition of the country. To the left are two modern, dynamic motifs that symbolize technical progress and, at the same time, military strength. First, a stylized rocket or spaceship and next to an illustration used on Soviet propaganda posters, depicting a man who aspires to the stars. IMPORTANT: An additional info sheet with more interesting background information is added to the box. 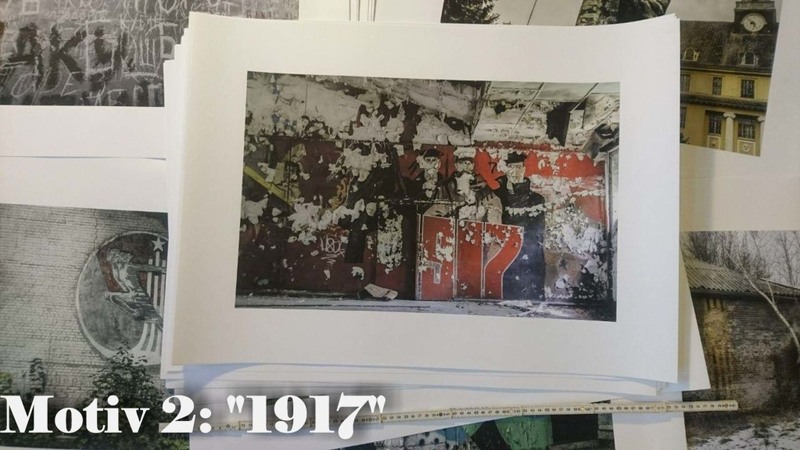 "1917" was a very special year for the Soviet Union, because the year of the October Revolution is regarded as the birth of the USSR. The motive therefore shows not only the year 1917, but also the revolutionary leader Vladimir Ilyich Lenin and to his right a Red Army soldier and two sailors. The head of Lenin is barely recognizable, as the color is already largely peeled off. On the left side, an industrial worker seems to be pictured next to a modern industrial facility. The picture is therefore intended to illustrate how the achievements of the "Great Socialist October Revolution" had their effect in modern times. 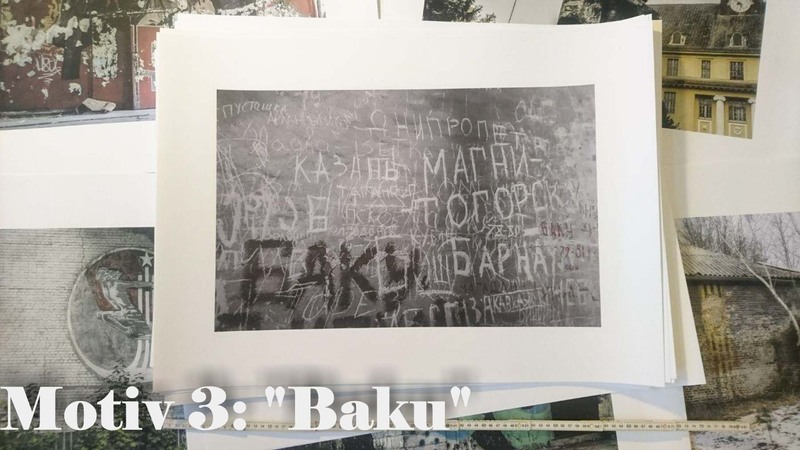 The motive "Baku" shows Soviet graffiti in an abandoned Soviet barracks in Brandenburg. The graffiti are painted or scratched into the wall with sharp objects. They bear witness to the former greatness and diversity of the Soviet Union. In this picture are cities such as Baku (Баку) - today's capital of Azerbaijan, Kazan (Казань) - capital of the Republic of Tararstan, the socialist planned city Magnitogorsk (Магнитогорск) in the Ural mountains, the West Siberian Barnaul (Барнаул) or the Far Eastern Magadan (Магадан). 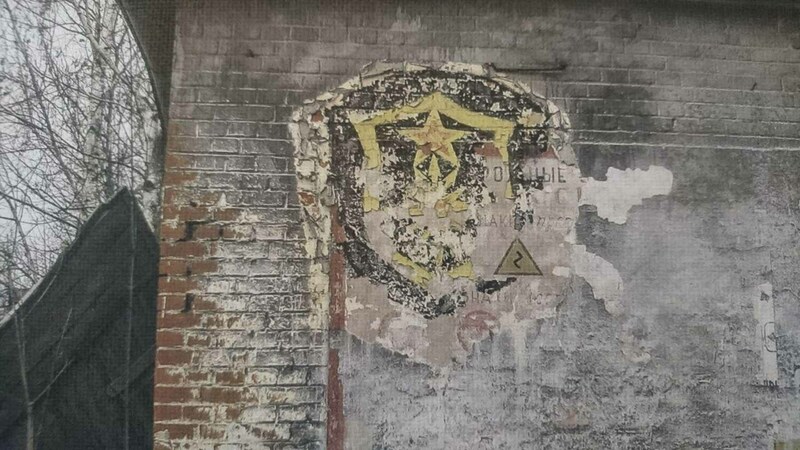 These graffiti in the attic of an abandoned barracks are also an expression of homesickness that many young conscripts felt during the harsh everyday life in the Soviet Army. The picture therefore carries a great melancholy. The colorful graffiti could be interpreted as a "door guard" who warns with his raised hand before entering the building. Guards in and around the barracks were a common sight at the time of the stationing of Soviet and Russian soldiers in Brandenburg and the rest of the GDR. The barracks remained for the German population a largely hidden world, shielded by high walls. Today, many of the former barracks are abandoned to decay and the buildings are liable to collapse. Also the house shown here is already in a bad condition. The walls are still standing, but roof, windows and doors are already destroyed. The white stones were characteristic of Soviet barracks. Likewise, the birches, which should probably convey a feeling of home. 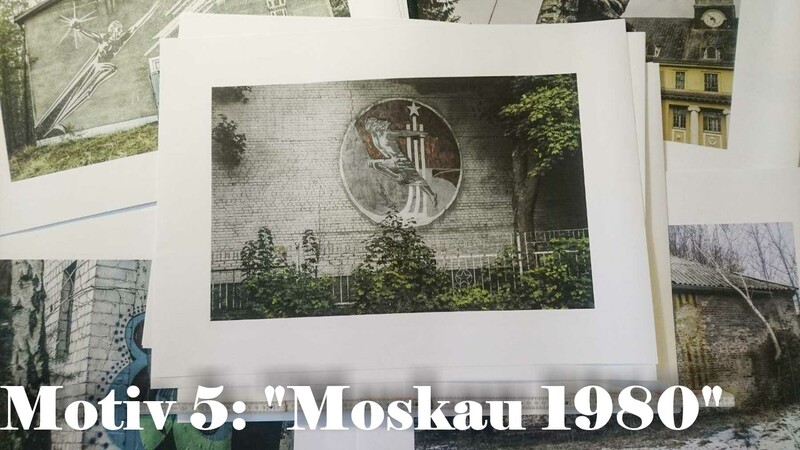 This motive is called "Moscow 1980" because the medallion on the facade of this abandoned Soviet barracks near Potsdam was inspired by the 1980 Moscow Olympics. The ascending rays with the star at the top are similar to the official logo of "Moscow 1980". Suitably, a sportsman and a sportswoman are presented in a dynamic pose. This medallion was attached to a sports hall, which was demolished in 2018. The relief may have been destroyed. The fence segments in the foreground also carry a star as a decorative element. The (red) star was a symbol widely used in the Soviet Union and the rest of the socialist world. 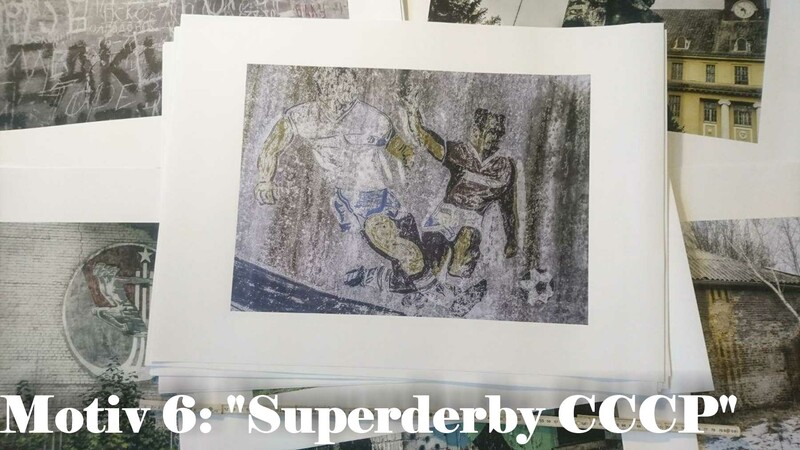 "Superderby CCCP" is the name of the motive with the football players fighting for the ball. The motive depicts a Dynamo Kyiv (blue) football player in a fight with a Spartak Moscow player (red). For decades, this football match was the largest and most explosive derby in the Soviet Union - the so-called "Superderby". After the collapse of the Soviet Union, this match only is possible in international competitions. 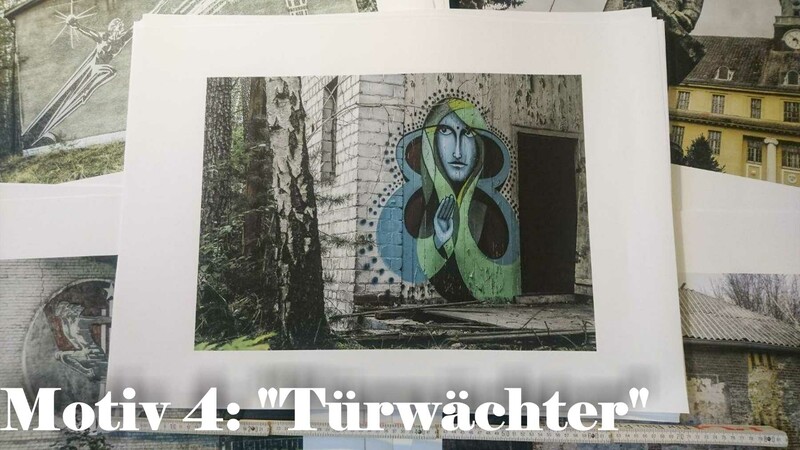 The picture was taken in an abandoned Soviet barracks in Brandenburg. It symbolizes not only the football passion of the Soviet soldiers, but is also a testimony of a bygone era. 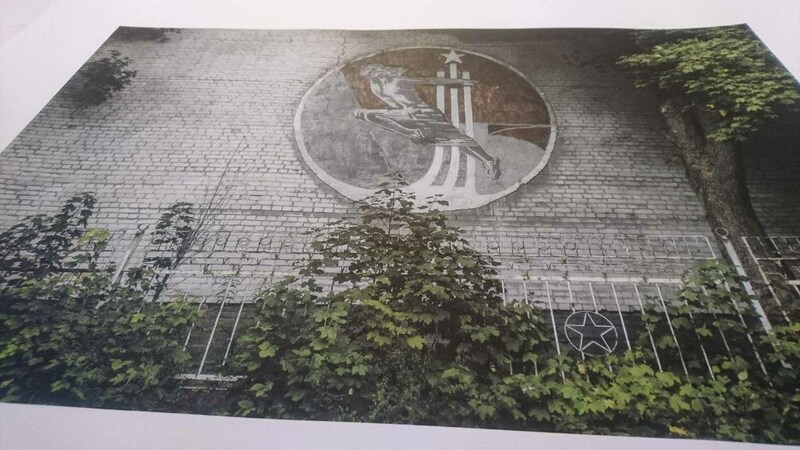 In the next few years, weather influences will obliterate the logos of the two top Soviet clubs and thus erase this history in this hidden place, where it has been conserved for so long. 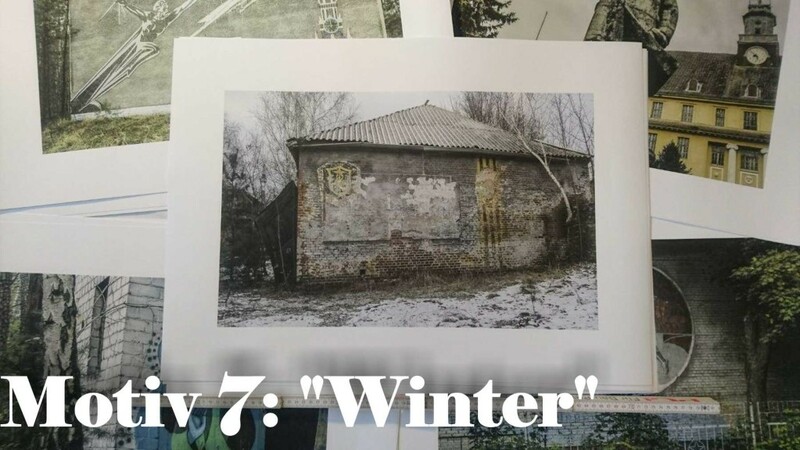 The motive "Winter" shows an abandoned Soviet barracks in Brandenburg in winter. A light blanket of snow has covered the landscape. In the shown building a vehicle park was accommodated. Alongside two emblems, various traffic signs are also displayed on the façade, which should familiarize the young soldiers with the traffic regulations. An already strong birch grows from the wall on the facade. It is symbolic of how nature conquers these Lost Places back. Lost Places Poster Available +++ Visit our Shop!